How many clouded leopards are left and what is their official status? Clouded leopards are classified as endangered by the US Fish and Wildlife Service. Other classification systems list them as vulnerable, but they are fully protected by law throughout their range. We have no idea of true population numbers since they are so difficult to study and research efforts have so far been fairly limited. Further study will help us determine the extent of their populations. What will it take to protect the clouded leopard? Where can I see clouded leopards in the wild? Clouded leopards are one of the most difficult of all wildlife species to encounter in the wild. The place where sightings occur most often is in Sabah, Malaysia, on the island of Borneo. How do my donations help clouded leopards? Donations to The Clouded Leopard Project are used for two main purposes. 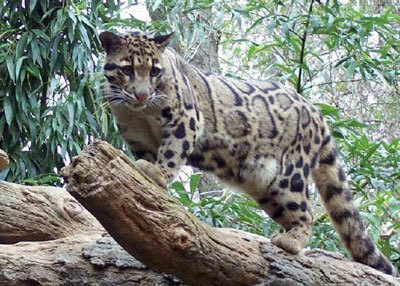 One is to support efforts to learn more about clouded leopards in the wild. By supporting field research projects in Asia, we help scientists learn what clouded leopards eat, where they live, and how they spend their time. By learning about clouded leopards, we can develop the best plans for protecting them. We also use donations to teach people about clouded leopards in the places where they are found. We provide materials and training for teachers so they can help their students understand why it is important to protect clouded leopards and their forest homes. These students live in small villages near the forests where clouded leopards live so it is especially important that they want to protect them. I’m just a kid so how can I help clouded leopards? One of the easiest ways to help clouded leopards is by spreading the word about their conservation needs. Do a school project on clouded leopards or talk about them on your website or blog. You can help support the work of The Clouded Leopard Project by raising funds through a garage sale, selling note cards, conducting a penny drive, or having a clouded leopard-themed birthday party and collecting donations. If you send us a story, drawing, or photos about what you have done or how you feel about clouded leopards, there is a good chance we will feature it on our website. We appreciate any support in our efforts to spread the word about clouded leopards! Can I volunteer to help clouded leopards? At this time there are no volunteer opportunities with The Clouded Leopard Project working on its projects in Southeast Asia. Currently, we are strictly a funding and education organization on behalf of these cats. In other words, we do not coordinate projects ourselves; instead we provide financial assistance and publicity for projects conducted by others. Perhaps in the future as we develop our own programs we may consider adding volunteer positions. We do, however, have needs for in-kind donations of volunteer work, especially involving graphic design, art, merchandising, or technology. If you have an interest in donating your services, please contact us for more information at info@cloudedleopard.org. I want to do more to help clouded leopards. What can I do? As with most conservation efforts, our primary need is financial assistance to support research and conservation efforts. If you happen to be in a line of work where you might have contacts with individuals or corporations that might be interested in partnering to further the cause of clouded leopard conservation, that would be a valuable way to provide assistance. We are hoping to advance our initiatives in Southeast Asia in the coming years and are always seeking in-country partners to help achieve those goals. The clouded leopard is an amazing creature and can definitely use all the supporters in can get, especially in its home range. I would like to gain experience working with wild cats. How can I work with clouded leopards? If you are interested in working with clouded leopards or other wild cats in North America, the best route would be to aspire to working in an AZA accredited facility that houses clouded leopards. Most zoos now require a four-year degree in one of the life sciences such as biology, zoology, or animal science. If you are interested in the education side of the zoo profession, education training is extremely valuable as well. Equally important is building a solid background of hands-on work with animals. There are many opportunities for volunteer experience at animal shelters, wildlife rehabilitation centers, and many universities with animal programs. We are unable to provide any volunteer opportunities working with clouded leopards. It can be competitive to gain entrance into the zoo profession. Most people begin as volunteers or as seasonal/part-time employees. Rarely do full-time positions open with carnivores. Usually you would need to accept an entry-level position working with other species and move into positions with cats/clouded leopards as positions open. Job postings are listed on the AZA website at www.aza.org if you'd like to see what types of jobs are available. I’m interested in gaining experience doing field research. Can I volunteer to help with the clouded leopard field work described on the website? It is challenging to gain this type of experience. Typically, hands-on field work is done by zoo staff, graduate students, and researchers. These projects are usually aligned with a zoo, university, or conservation organization so your best bet for participating in similar research would be to gain employment or enrollment at one of these types of institutions. We do help provide funding to candidates working on projects involving clouded leopards, but we do not offer any placement assistance for those programs.